For a cyclist a large aerobic engine is essential. When you go for a ride you stimulate your aerobic system, but how much stimulation depend on the intensity you ride with. Trained cyclists need a greater absolute and relative workload to keep improving the VO2 max. Thus, if you are an experienced rider, it is necessary to do hard intervals or races to make further progress. Elite athletes will some time reach a plateau where there will no longer be significant increments. At this level the riders train to work at VO2 max for a longer time. As I have described previously in ‘How to train with a power meter for VO2 max’, it is a very good idea to do a 5minutes all-out test to find your average Watt at maximum oxygen consumption. There other tests, but I think that this one is easy to use and still very reliable. You can do the test on a stationary bike or on the road if you are the lucky owner of a power meter. All intervals should be done with an intensity found in the maximum power test. This one is a winner. Done correctly you got 9 minutes effective training at your VO2 max. You can make a little twitch to this one by making the recovery period shorter. That will give you more time with maximum oxygen consumption. I like this one very much even though it is not as effective for your VO2 max as interval program no. 1. It is though very good for race preparation and is very often used in the personal training programs I make for my riders. Normally I recommend 3 to 4 sets. This is the hard way. I do not recommend it, but it works. Really like this workout and currently this is my favourite workout if you want to boost your VO2 max quickly. Based on scientific studies these intervals are some of the best in theory. But like in all other training situations it is important to be motivated for the thing you decide to do. Do you really recommend only 1 x 5′ set? I see, in other coaches’ website and forum, that it’s common a 5 x 5′ approach..
i have been doing these intervals for a couple of months now and am certain they have made a difference. time will tell if they help me beat my century ride pb later this month. fingers crossed and i will let you know!! I like your articles and training tips. However, sometimes I find your descriptions very cryptic. You tend to assume that all readers are familiar with certain terminologies. This article is a good example. I can see that somehow this adds up to 9minutes, but can you perhaps write it with a little less jargon. Clearly the brackets mean something, but what? 3 repeats of 3mins, with 3minute rest between? Of the 4 workouts you have them listed 1 thru 4 where you make the argument “Really like this workout and currently this is my favourite workout if you want to boost your VO2 max quickly.”. Does that mean that #4 is the best for boosting VO2 or is #1 “the winner”? You don’t like #2 as much as #1, #3 is hard but effective (not as much as 1 or 2?) and then there’s #4. I too am a cyclist with limited training time (job, kids, etc…). I try to do as many high intensity workouts as I can reliably reproduce which means every other day essentially with easy spins or off days in between. Could you do these workouts realistically more than a few times a week? TLC>> Thanks for commenting, I have decided to remove the numbers, because they were not supposed show a rank of the intervals. I use all the mentioned intervals together with a group of other VO2 workouts. High intensity training every second day is realistic and safe way to improve performance. If you reduce the volume of intervals it becomes possible to do them every single day. I use such strategy for specific tapering protocols etc. My 5 min max was 380. I followed all 14 days of the vo2 max programme. After the 1st 7days I adjusted the remaining programes as If I had a 400 watt 5 min max. Managed to get a second place , so I think the routines work well. Are there any follow-up routines available? Hi Jesper, I have started the Vo2 Booster and going well , in the final six weeks to my event – 2k individual pursuit I would like to know if I should reduce the 3+3 to 2+2 and ride at a higher percentage of 5′ test? With the work to rest ratio equal it would still be aerobic, with a small anaerobic contribution but working at higher powers which would be more event specific. Even closer to the event 2′-3′ race efforts with long recoveries, should these be done as negative splits 1’at 95%2’100%3’105% of cruise power for the event? The 2nd and 4th workouts seem very similar. Do you recommend rest time in between the sets on the 5 x (40 + 20sec.)? 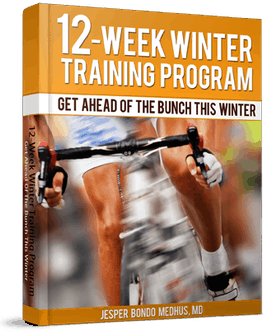 I ve been doing these programs and find they have been very helpful and perversely enjoyable! One question – cadence. Do you recommend say 90-95 in a heavy gear or 110 in a lighter gear? I have been doing the former, but thinking about some sessions at high cadence instead as a change. I have found that even doing 1 or 2 mins of high intensity intervals on my rest days help the recovery and help keep me “sharp”. Thanks for the website…great stuff! at first I thank you for briliant articles. 2. What are better intervals 3 min plus 3min or 30 seconds plus 30 seconds? 3. I am contemplating about buying your e book. Can you tell me about book more? Thanks for all the great info. I found it extremely useful. Been cycling for years, and go with a fast group each season every sat. A couple of them are racers and I can usually keep up. My question is. I want to start racing this year (finally bought me a good carbon fibre bike). So I have been traing pretty hard at our local gym inside. After reading your article on VO2 Max sesions I decided to try this morning the 3 x (3 + 3 min). I am 56 yrs old, which by calculation means my MHR should be 164. Upon doing the Interval training, I can reach over 170 with moderate to hard effort and on the last interval I pushed over 180 for the last 90 seconds. So, I’m a little confused as you can probably deduce. Since the idea is to exercise at 95% of MHR. My intent is to increase my VO2 max, so should I continue with the greater than 100% MHR or drop back down to 95%? I appreciate your imput. Thank you. There is a huge standard deviation on age predicted max heart rate, 95 are within the range of +/- 20 beats of the predicted value. So your maximum heart rate is 180 (or maybe even higher). And training won’t change your maximum heart rate, but your VO2 max will go up. How many of these sessions would you recommend per week? Also, should I do them year round, or only in the weeks leading up to a race? Thanks. The 30/30 intervals was studied using runners,are you sure it will work for cyclists? Vo2 max is hit later on the bike. @Jordan – 0 to 3 times per week depending on your goals. It’s possible to do these intervals all year, but normally I only use structured VO2 intervals maybe 2/3 of the season (estimate). @Richard Hand – Yes, you’re right that the most important studies using 30/30s intervals are performed with runners. Fortunately, these intervals also work on cyclists. For example the VO2 max booster program has successfully used these intervals to improve 5min max power for thousands of cyclists since it was released in 2009. I’ve started doing intervals on an indoor Cross-Trainer where I can measure power output and energy consumption quite accurately and control intervals easily. However it occurred to me that Intervals are about training energy pathways and neural configuration in the muscles, so presumably its muscle group specific? and so to get any benefit I need to do it on the bike using the same muscles and not a Cross-Trainer which uses more muscles but only some of the same ones? Hi! If recovery is longer, will it ruin 3+3min interval training toltally? I find nice to do all invervals in same road with tail wind but it takes bit long to ride back to start agains headwind with recovery pace. Did new test; Avg 6.1 W/kg over 5′. 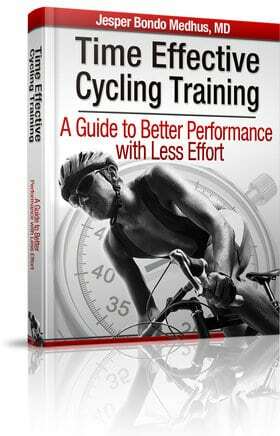 Hi Jesper, I am very new to more effective cycling. I bought myselt a trainer to do more indoor workouts, these VO2 interval sessions where the one is described Like 3X ( 3+3min) , how do jou perform it, I make use of a heart rate? I would like to try your training bu I don’t have a power meter. My ergo only has speed, cadence & 7 gears. Can I do threshold test using the speed. I did both 3 x ( 3min on + 3min off ) and 18x ( 30 sec on + 30 sec off ), the on sections were done at my 5min maximum power. When doing the 30 sec intervals my heart rate a maximum of 185bpm while doing the 3min I reached 193bpm, my MHR is 199bpm. If there is a direct relation between HR and oxygen consumption looks like the 3 x ( 3min on + 3min off ) is better, for me both felt good, I guess it doesn’t hurt to mix it up from time to time. Hi Jasper. This is nice web, I can fully agree with you VO Max recommended interval sessions from the perspective of XC double-poler. I’m used to use all types of your called killer intervals with very same reps. I successfully practiced also this one : one iteration takes different time , generally it is months . C) As training progresses, the session goes to continuum of 7min @ VO Max level. When this is reached, new iteration starts with new max4min level, point A). Strength Training On The Bike?